Several lines of evidence suggest that micromere signaling plays a key role in endo-mesoderm differentiation along the animal-vegetal (A-V) axis in sea urchin embryos. A recent study has suggested that the activity of micromeres of inducing endoderm differentiation of mesomere descendants is, unexpectedly, maximal at the hatching blastula stage in the echinoids Scaphechinus mirabiris and Hemicentrotus pulcherrimus. 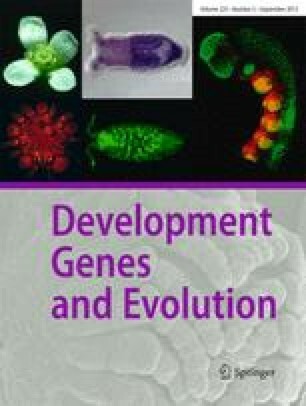 In the present study, to confirm the inductive capacity of the micromere descendants in normal development, the timing of initiation of gastrulation and the elongation rate of the archenteron were examined in both micromereless embryos and in micromereless embryos cultured until the hatching blastula stage and then recombined with micromere descendants of the same age. The micromereless embryos consistently exhibited a delay in the initiation of gastrulation and a decrease in elongation rate of the archenteron, as compared with those in controls. In contrast, when the micromereless embryos cultured until the hatching blastula stage were recombined with micromere descendants of the same age, the recombinant embryos exhibited rescue of both the delay in initiation of gastrulation and a decrease in elongation rate of the archenteron. The delayed expression of alkaline phosphatase activity, an endoderm-specific marker, in the micromereless embryos was also rescued in the recombinant embryos. The recombined micromere descendants formed the larval spicules in the same schedule as that observed in the controls. These results indicate that at the hatching blastula stage, micromere descendants emanate a signal(s) required for normal gastrulation of the presumptive endo-mesodermal region.